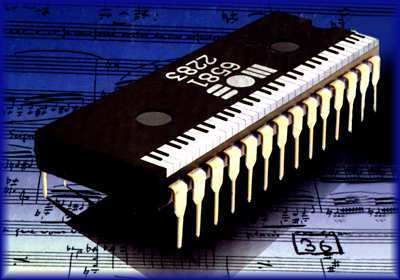 The 6581 Sound Interface Device (SID) is a single-chip, 3-voice electronic music synthesizer/soundeffects generator compatible with the 65XX and similar microprocessor families. SID provides wide-range, high-resolution control of pitch (frequency), tone color (harmonic content), and dynamics (volume). Specialized control circuitry minimizes software overhead, facilitating use in arcade/home videogames and low-cost musical instruments. The idea for building up this site grew out of the HardSiD yahoo group (see [links section]) when discussions about SID versions came up. Many of the facts on this site are taken from the group mail archive or are contributed by the list members. Most of the documents and files listed on this site are provided by various people, some were found on the internet, other were written by me. I do not have the time and possibilities to check everything for copyright issues. If you find something on this site that may violate any laws or copyrights that please let me know and I'll remove it. This site is under construction and it will always be. I'm always collecting further pieces of information about the SID to complete this site. Please feel free to drop me a line if you have some information not mentioned here or you find something wrong on these pages. Get involved, discuss inside the [forum]!